The Hamilton Beach Indoor Contact Grill features a beautiful trendy style and lets you enjoy the taste of grilled food. This portable indoor grill features removable grids, which are completely dishwasher safe making cleaning easy. 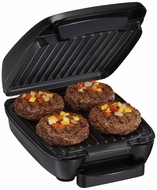 The indoor grill with removable grids features a large Non-stick cooking surface that opens flat to 60 square inches. This dishwasher safe grill can be used to prepare a variety of delicious and mouth watering recipes in just 10 minutes or less. For added convenience, it features a timer or stay on function.